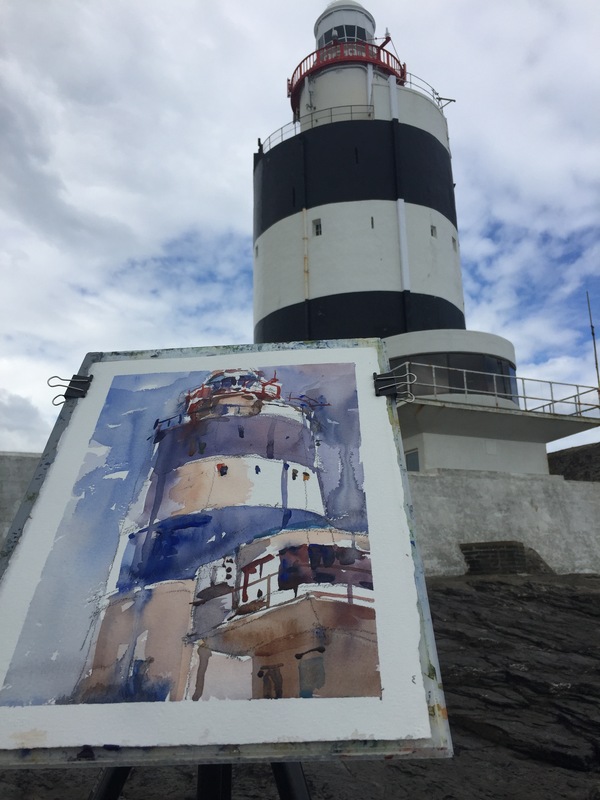 The Hook Peninsula is a regular venue for the Wexford AITO (Art in the Open). I find that when I first arrive at a pre-arranged venue, I have eyes for the main item only. The Light house. And why not? It's an amazing eye-full. So that's exactly what I chose. 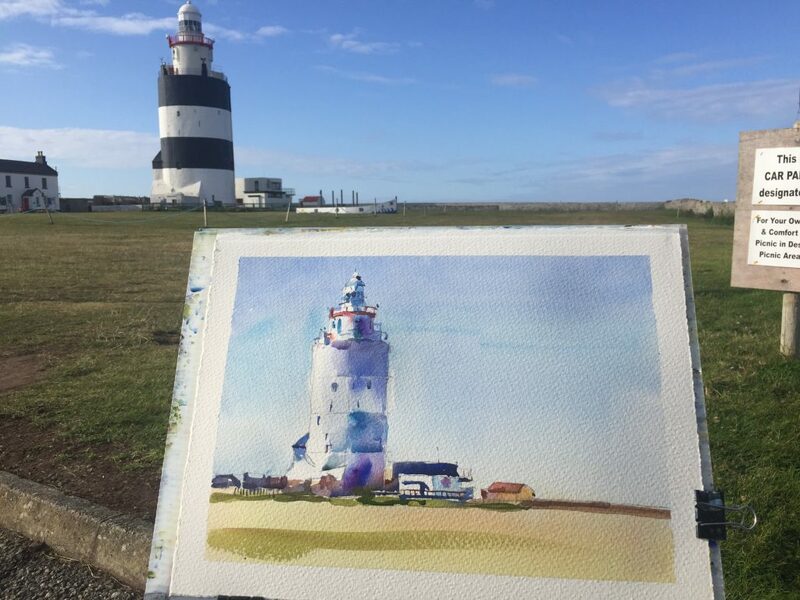 I painted the lighthouse. At that stage, maybe 8.00 am, there was no one else about. No other painters I mean. So I had sunshine and peace. I usually like to start the day by painting the first thing I notice. Not to look too pensively for a subject. Because at the start of a session, my eye is not yet in. I'm not seeing as an artist. I'm seeing 'normally'. Or with the left hand side of my brain. It's only once I've started sketching or painting, that my right hand brain kicks in and I begin to see better possible subjects. But at that stage I'm committed to my first subject choice. So my usual plan is to start with a quickie, to 'get my eye in'. Then hope that the landscape is transformed into a feast of possibilities. As usual my initial 'quickie' turns into ''longy'. I chose to paint in watercolour this year. So for me a watercolour is only going to last a matter of minutes. Pencil sketch, 5 minutes of a simple subject. First wash 10 minutes. Let it dry 10 minutes. Second wash 10 minutes. Accents and highlights and few minutes. So the whole thing this lasts only a half hour or so. 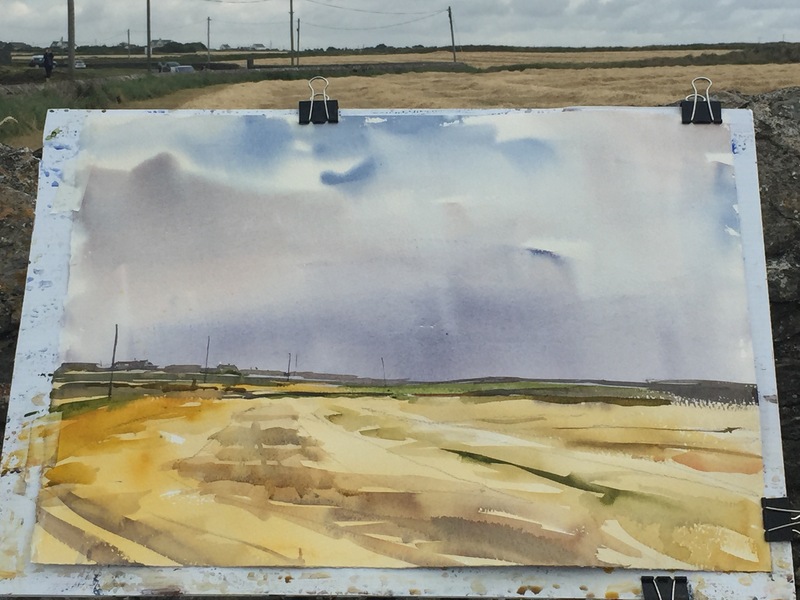 So even a long drawn out watercolour is still only 35-40 minutes. So the idea of an initial quickie, is more a concept in my mind that a reality. I say to myself .. don't expect too much from the first of the day. Treat it as the warm up exercise. So that's how I treated this first view of the lighthouse. Next I chatted to some new arrivals. Trying to enthuse myself I guess. Had my first been a cracker, there would have been no holding me back. But as it was I under-whelmed. So what next. Look behind. It's always a good idea. Might not always work. But I always do it. By that time the sun had gone behind a large bank of clouds. It would not reappear for an hour or more. So my plan was to kill an hour by painting the barley fields. That should bring me up to coffee time. Not a bad plan really. As it happened the morning sunless air was cold. So My first wash would not dry. So my patience was wearing thin. Do I wait for a half hour for it to dry? Or risk a second wash too soon? I tend to lose interest in the painting if it drags out too long. So that's what happened here. Foreground painted before the underlying wash was dry....and a subsequent lack of enthusiasm to finish. 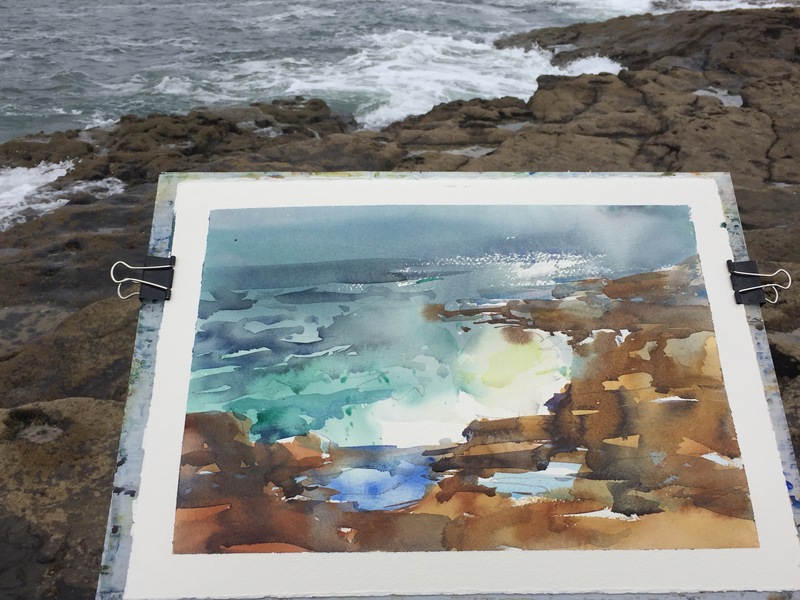 About mid-day I decided to try a sea-scape. What could go wrong? Nothing went wrong. I set up. I cheated. I took a photo of a crashing wave. Then I sketch what I saw in front of me using the photo to remind me of the wave shape. I writing this blog 6 months after the event. I recall thinking that the first wash would take at least a half hour to dry. So I felt the need to walk away. Otherwise I would be tempted to second wash too soon. So I wandered off to see what the others were up to. Every now and again glancing down to see if my kit was in still there or washed out to sea. All went well. I returned, finished and for once I can say that I am delighted with the result. That's rare. I almost always beat myself up for perceived errors. So I guess I'll return to the same spot next year to see if I can do it again. Watch this space. What next? Lunch. More frolicking about. 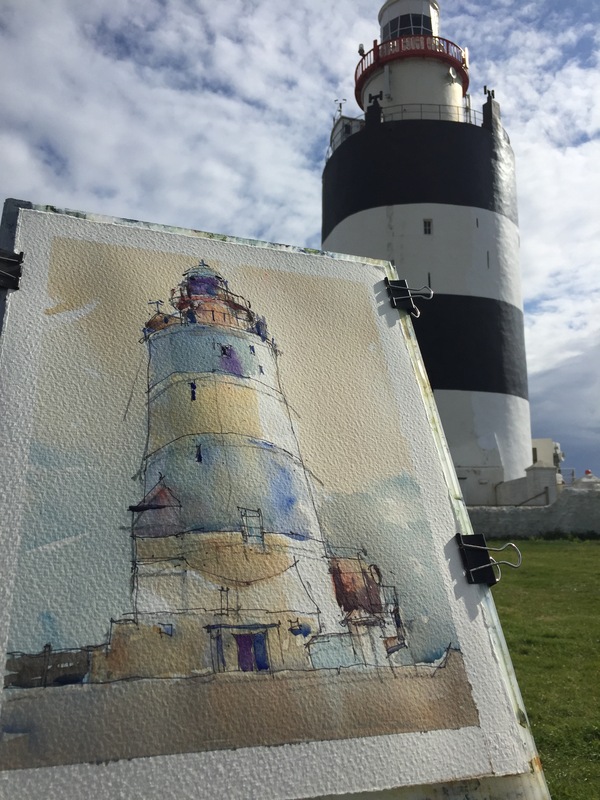 Then another stab at the lighthouse. Perhaps a close up. From the rocks on the south side. Okay, so it's not great. More patients required. I'll speak to the doctor about that. One last one. By this stage must folks had left. The sun was out again and it felt a shame to not grab an opportunity. I do wonder if a trip to the pub might not have been more useful. But hey..